Danny Haynes scored more runs for Wisbech. Danny Haynes is a player bang in form at the moment. Last weekend the Wisbech batsman smashed an unbeaten 138 in a Rutland League win over Barnack. 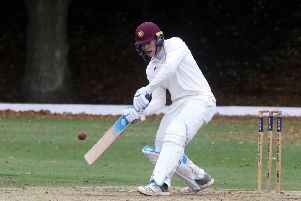 Yesterday (August 8) he steered the Fen boys to a seven-wicket win against Waresley in Division One of the Cambs League. After Waresley had been shot out for 160 in 43.4 overs, Haynes set about the home bowlers with gusto. He smashed 15 fours in his 84 not out, which came off just 67 balls, to see second-placed Wisbech home at 164-3 in just 23.5 overs. Top bowler for Wisbech was Gary Freear with 4-41 off eight overs. Tom Meyrick was next best with 3-37. Elsewhere there was little to shout about for the local teams in Division One. March gained a draw at Warboys but there were defeats for Ketton, Nassington and Ramsey. Ash Vodnala was in good nick for March as they totalled 188-8 but Warboys hung on at 127-9. Toby Nulty took 3-9. Burwell seconds posted a whopping 312-7 at home to Ketton, who were then dismissed for 127, while Nassington’s 175-9 was overhauled by visitors Histon. They reached 178-5 in 45 overs. Top scorer for Nassington with 42 was Ryan Duffy. Ramsey were dismissed for 112 at home to Saffron Walden, who won by three wickets. In Division Two struggling Khalsa lost again. They were all out for 155 against visitors Eaton Socon, who reached 159 without loss in 33.5 overs. And Newborough also lost. They entertained Huntingdon and went down by 46 runs. Huntingdon’s 218-8 was topped by 52 from Nikhil Kumpukkal while Ali Greenwood took 4-31. Openers Greg Rowland (56) and Stewart McCracken (44) got Newborough off to a sound start. But after they were dismissed the innings fell away and they were all out for 172.